The hallways of Seattle schools were packed as always on Wednesday, October 19, but the difference was that thousands of teachers, students and staff were wearing similar t-shirts affirming Black lives. The Black Lives Matter at School day originated among teachers committed to social justice and was ultimately endorsed by the teachers’ union, the NAACP, the Seattle Council PTSA, and event supported by school district. Jesse Hagopian, a teacher at Garfield High School in Seattle and editor of the book More Than a Score: The New Uprising Against High-Stakes Testing, answered questions from Brian Jones about how the day came about and what can come of it in the future. This interview was first published at Socialistworker.org. Brian Jones: THE WEDNESDAY of Black Lives Matter at School was pretty special. How did your day start? 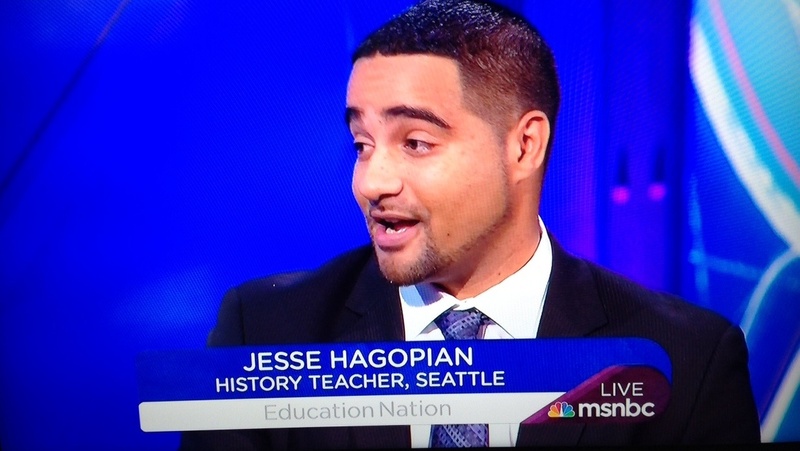 Jesse Hagopian: IT WAS an incredible day–like none I’ve ever experienced before. It started with getting dressed and putting on my own Black Lives Matter shirt, and my older son’s shirt, and then my 3-year-old’s shirt. I began by taking my second grader to school. We get to school, and on the front door is a letter from the school’s PTA stating why it fully supports teachers wearing BLM shirts to school. That put a smile on my face that only got bigger when I opened the door and saw all the faculty in the building wearing BLM shirts. And then the principal wearing a BLM shirt. And then the school counselor wearing the shirt. I talked to my son’s teacher about the plans for the day, including showing the students a picture of Colin Kaepernick and asking them what they thought his “taking a knee” protest was about. So I knew right away that this was going to be much bigger than just wearing a T-shirt–that the lessons were going to be deeply meaningful to challenging injustice. It was really breathtaking from the beginning. Then I went to drop off my younger son at pre-school, and all of his pre-school teachers were wearing the BLM shirts. It was just a celebration. We were all so thrilled that we could come out and say what we all believe, and not be afraid. Brian Jones: YOU WROTE on your blog that this has never happened in an entire school district. How did the Black Lives Matters At School day spread to more than 2,000 teachers? Jesse Hagopian: IT STARTED with a couple of brave elementary schools, Leschi and John Muir, which at the very beginning of the school year wanted to have a celebration of Black lives by having African American community members come to the schools and celebrate the students on their way in by giving them high-fives, and then holding dialogues during school. At John Muir Elementary, a group called Black Men United to Change the Narrative helped organize the action, and teachers designed a Black Lives Matter shirt. The media got a hold of the design, and they freaked out, attacking these teachers for having the audacity to declare that their Black students’ lives are important. Then some hateful individual made a violent threat against the school, and the school district announced it was going to cancel this celebration of Black lives at John Muir. But to the teachers’ and the community’s great credit, they carried on–many of the teachers wore their shirts and many of the community members showed up anyway. It wasn’t as large as it would have been without the threat, but these teachers showed real bravery. Those of us in the Social Equality Educators (SEE), a rank-and-file organization inside the Seattle Education Association, reached out right away to those teachers and invited them to our meeting to share their story. People were so moved by their work that we decided we needed to show solidarity, and that the best way to do that wouldn’t be to just pass a resolution saying we support them, but to take it a step further and spread this action to every school. When we brought it to the meeting of the union’s Representative Assembly, we weren’t sure what to expect. But we’ve been building SEE for a long time, and we’ve built up a lot of respect and credibility. So when my colleague Sarah Arvey, one of the leaders in SEE, put the resolution forward to spread the action to every school, a couple of us spoke to it, and it passed unanimously. That was the first thing that caught me off guard. It was a sign that this was going to be a significant event. We went to work on a couple designs for shirts teachers could order. The first was a version of the shirt that John Muir wore–it was designed by their art teacher, Julie Trout, and featured a tree and the words “Black Lives Matter. We Stand Together.” The second design also said “Black Lives Matter,” but featured the solidarity fist and added “#SayHerName,” the hashtag created in the wake of Sandra Bland’s death to highlight police violence against women. After that, we moved on to figuring out how to organize a t-shirt distribution operation for an entire city–thousands of shirts of various sizes had to be ordered and distributed. But over the course of the next few weeks, we ran out of our orders for more than 2,000 t-shirts. Plus many schools made their own t-shirts. So when you factor in the number of parents and students wearing their own shirts, many thousands of educators and public school families made this declaration to affirm Black lives. Brian Jones: SEATTLE TEACHERS have been through a few struggles in the past few years, whether it’s the MAP test boycott or the strike at the start of school last year. I’ve heard you talk before about how these mass collective struggles are really the best teacher of all–about how people change in moments like this. Does that apply here? Jesse Hagopian: IT REALLY does. It’s incredible to see the transformation that people go through when they take these bold steps and struggle collectively. At Garfield High School, the faculty voted unanimously several years ago to refuse to administer the MAP test, and then we were threatened with suspension without pay, but the school district ultimately got rid of the test altogether. The lessons of that emboldened the staff over the course of the past two years in ways that I’ve only read about class struggle teaching people their own power. When they threatened to get rid of a teacher at Garfield a couple years ago, the entire building emptied out to rally and say we need more teachers in the building to lower class size, we refuse to allow the district to remove a teacher. And we won that battle. But you saw these lessons spill out across the whole Seattle School District in the strike last fall, when the union stood up to fight for an end to standardized testing in our evaluations, largely inspired by the actions of the MAP test boycott–but also more recess time for kids, and race and equity teams in every building. I think it was social justice teachers in the union demanding that race and equity teams be part of the contract fight–introducing a discussion about the necessity of educators to confront institutional racism–that laid the groundwork for this incredible day we had of Black Lives Matter at School Day. Brian Jones: I KNOW the SEE caucus has been putting out some specific ideas about further demands to make about changes in the schools. What were some of these? Jesse Hagopian: WE’VE BEEN working for some time on issues of undoing institutional racism in our schools. One issue where we would like to go further in this new moment is trying to end disproportionate discipline in Seattle public schools. The Department of Education came in and did a study that shows Black students are suspended at four times the rate of white students for the very same infractions in Seattle schools. So we would like to fight for an end to zero-tolerance discipline and move toward restorative justice practices, which instead of pushing kids out of school actually try to solve the problems that they face. We want an end to the rigid tracking system that has so deeply segregated our schools and classrooms, largely excluding Black students and other students of color from advanced classes. We also think it’s vital that Black students be able to learn about their own history–their struggles and their successes. And we want to have a new fight for ethnic studies programs in our schools. Those things were really validated when we had an evening rally as the culmination of Black Lives Matter at School Day. It was standing room only and packed to the rafters with families who came in their BLM shirts to hear from a wonderful lineup of performers and activists and organizers–and, most importantly, students. We held a roundtable discussion with students from several high schools and middle schools, and they really laid out what the problems are–the way racism manifests in our schools, the steps they’ve taken to challenge this, and what they would like to see different in the schools. A lot of what they expressed were problems that SEE has been working on. So I imagine we’re entering a new era in Seattle around education. Our city will never be the same, because we have an emboldened core of teachers and students and parents who I think will be more readily mobilized around these kinds of issues. Brian Jones: I SAW that the Garfield High School football team was making headlines for kneeling during the national anthem, following the example of San Francisco 49ers quarterback Colin Kaepernick, and you mentioned that students spoke out at the forum at the end of Black Lives Matter at School Day. So there’s already a pattern of students in Seattle, and at Garfield in particular, taking a lead on these issues. What do you think comes next? Jesse Hagopian: THE FIRST thing to say is that critics of our movement say “don’t politicize the school”–but the students are already talking about the BLM movement every day, in all of our school buildings. And they’re taking action, whether it’s on the football field or the volleyball court or at rallies. They’re having deep discussions about the systemic inequalities, the realities of racism that they face every day–and then they get to school, and they’re supposed to stop talking about the issues that matter most to them. That’s a bizarre disconnect. School is supposed to be a place to talk about the things that matter most, and now they’re being allowed to do that. So I think that a lot of what the teachers did in wearing that shirt was inspired by the actions of students who are protesting all around the city. The most powerful experience of the day for me was the rally we had at Garfield. On the steps of our school at lunchtime, we had a speakout, with the coaches and the counselors and the teachers and many students on the steps. People were sharing why they wore the shirt, and I saw one of my colleagues, Janet DuBois, with tears streaming down her face. She beckoned me over, and she asked me, “Should I tell everybody?” I knew exactly what she was referring to because she had revealed this secret to me a year ago, but hadn’t told anybody else. So right there, in front of all the media assembled to document our rally, and in front of all the students and staff, she let everyone know about the pain she’d been carrying for years because the police had murdered her son in a city in the south of Washington state. She had to leave the teaching profession for many years until she could bring herself to come back. When she did, she got a job at Garfield, but nobody knew about that trauma she was dealing with. If nothing else comes out of the Black Lives Matter at School Day, at least this wonderful educator won’t have to suffer with that pain by herself–now, she has the support and solidarity of her community. I think it was one of the most incredible moments of my life to see somebody look around and have an entire faculty wearing BLM shirts–and feel like in that moment she could finally tell her truth.